In his March Youth Sports Hero of the Month blog, Doug Abrams honored 12-year-old Matthew Marotta for his sportsmanship at the end of a hard-fought pee wee hockey tournament game in Winnipeg, Manitoba. 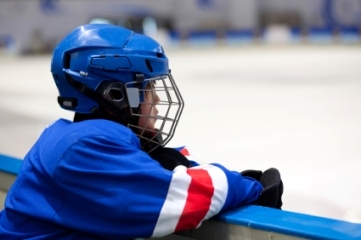 In this post, the former youth hockey coach focuses on the factors sports leagues should weigh in considering disciplinary measures against a coach, using the Marotta incident as a jumping off point. On Sunday, February 16, the Nanaimo (B.C.) Clippers edged the Prince George Cougars, 3-2, on a hotly disputed goal in the final moments of a hard-fought double-overtime pee wee hockey tournament game in Winnipeg, Manitoba. The victory moved the Tier I Clippers into fifth place in the 43rd annual Vernon Coca-Cola Invitational. When a pee wee hockey team lost in controversial fashion in overtime, the coach decided not to go through the traditional post-game handshake line to congratulate the winners. Except for one player, who shook his head when his head coach called him to leave the ice with the rest of his team. Note to reader: I wrote this blog on February 25, 2014 and updated it to include new information and updates one year later February 25, 2015 about a new "helmet add-on paper. Last week, we posted to the site a group of four articles about a peer-reviewed study in the Journal of Neurosurgery showing that football helmet design affected concussion risk among a large group (or what scientists call a "cohort") of college football players. Last week, we reported on a peer-reviewed study showing that football helmet design affected concussion risk. At the same time, we received a press release about an abstract of a research paper on football helmets reporting that they do very little to protect kids against the rotational forces that cause concussion. MomsTEAM decided not to report on the paper, and here's why. This column has always followed a "one and done" approach. I tell an inspiring story, and then seek a new one for the following month. I have never recycled old "heroes" columns because the media provides a steady stream of positive stories for readers who are concerned about values in youth sports. This column has always followed a "one and done" approach. I tell an inspiring story, and then seek a new one for the following month. I have never recycled old "heroes" columns because the media provides a steady stream of positive stories for readers who are concerned about values in youth sports. But this month's column is different because it revisits the story of Jonathon Montanez and Mitchell Marcus, who were last February's heroes, because the story has not grown old and continues to capture headlines. When MomsTEAM launched its Youth Sports Concussion Safety channel back in 2001, I suspected that people at the time must have thought the time and energy a team of experts, MomsTEAM staff, and I spent on the topic of youth sports concussions bordered on the obsessive, especially as no other youth sports website, much less the mainstream media, was talking about it at all back then. When MomsTEAM launched its Youth Sports Concussion Safety channel in 2001, Brooke de Lench suspected that people at the time must have thought the time and energy she was spending on the topic bordered on the obsessive. 14 years later, as Brooke reports from the #C4CT concussion conference at the United Nations during Super Bowl Week, it has become a national obsession. This week's episode of "Friday Night Tykes" hit a new low. This week's episode of "Friday Night Tykes" hit a new low. In case you missed it, be forewarned: while it is chock full of "teachable moments" which continue to show precisely how not to run a youth football program, it is really getting to the point where it is painful to watch, making it increasingly difficult for me to say that it continues to be "must-see TV" for its educational value. It was so disgusting, that two days later, two of the coaches were hit with suspensions from the league. Yesterday in New York, the Sports Legacy Institute announced a certification program for head impact sensors to track the number of hits a player sustains above 20 g's of linear force. It wasn't exactly what I had expected, but, nevertheless, a move that I wholeheartedly support. The announcement by the Sports Legacy Institute of a certification program for head impact sensors to track the number of hits a player sustains above 20 g's of linear force wasn't exactly what Brooke de Lench had expected, but, nevertheless, a move that she wholeheartedly supports. As was the case with the two-hour premiere, the third episode of "Friday Night Tykes" on the Esquire Network continued to be "must see" television for youth football parents for its educational value. Here are some of the safety issues it raised, with links to MomsTEAM content for further reading.